I serve the team at Webflow, I'm a web designer and lover of animating all things on the web. I enjoy writing about my thoughts on web design, going hiking, snowboarding, surfing, swimming, making YouTube videos, taking pictures of our doggo and hanging out with friends and family. This is likely the easiest place to get ahold of me. Just Tweet at me or send me a DM on Twitter if you'd like to connect. RT @DannPetty: We’re going to interview @basicagency tmrw for @epicjobs — what should we ask them? 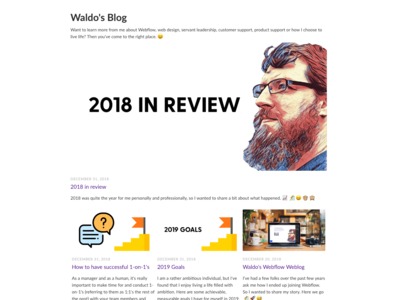 RT @just_watt: Building a new personal site using @webflow and I am blown away by this platform. @bentossell, you were right. @MattDMcCarley @jonmajorc Ah I'm stoked to watch that! Thanks for sharing 😁 it's incredible what some skaters are doing nowadays. @MattDMcCarley @jonmajorc As a skater, I really enjoyed reading this 😁 some of the most resilient and talented people I know are skaters 😁 definitely wouldn't be the same person I am today if it wasn't for skating. Thanks for sharing Matt! @ispykenny I use the Kuna Toucan and absolutely love it: https://t.co/hjceUaFaPQ Super low cost subscription with AI detection software and notifications. Works like a charm 😁 considering getting one or two more. @AndrewDelPrete Crushed it! Great swim! @jaymstr @webflow Hi Jameson! Can you please let me know what your custom domain is? The best place to contact us is via our support contact page here: https://t.co/iRDLMV1Dv6 Thanks in advance! I'm here to help! RT @DannPetty: Next @Epicurrence will be in Oct as usual. Where do you want to go camp, climb, moto, and adventure? RT @bryantchou: If @webflow would throw a conference, would you attend? @HeatherDoshay @callmevlad @webflow Super duper thankful for you to join us Heather!!! @happycrappie Hi there! That is definitely unexpected behavior to be occurring within your Webflow site or while editing product items. Can you please DM me and let me know which site you're experiencing that issue on? @austinthesing @lacroixwater Yes, and it's fantastic. @kurtvarner Ooh that's gonna be awesome! Please let me know if you need any recommendations for South Africa 😁 so happy for you Kurt! RT @acroll: Less “women in tech” panels. More women, in tech panels. @jina @Delta Ooh have a wonderful time! If you want the most delicious food possible, make your way over to The Brass Bell: https://t.co/sD5E0LaO38 If you don't enjoy the food, I'll venmo you for the meal. Best calamari on earth, amazing fish and sweet location 😁 safe travels! @thepixelgeek @Allbirds I got a pair! They're super duper comfy! As a manager and as a human, it's really important to make time for and conduct 1-on-1's (referring to them as 1:1's the rest of the post) with your team members and colleagues. I am a rather ambitious individual, but I've found that I enjoy living a life filled with ambition. Here are some achievable, measurable goals I have for myself in 2019. Where/How did you find me? Thank you so much for reaching out, I will be in touch shortly.